That simple moniker still resonates heavily throughout the vast spectrum of streetwear and pop culture. Whether you’re style is hip-hop or punk rock laden, it doesn’t really matter – you’ve worn these shoes or know someone who has. Sneakerheads and occasional admirers alike know what the deal is when it comes to dressing your feet in this delectable treat. Okay, okay, enough with the pedestal raising. I’m just partial to this shoe, forgive me. The Converse Rubber Shoe Company parted its doors for business in 1908 by founders, Marquis Mills Converse and his cousin, Elisha Converse. Initially, their efforts were centered around producing rubber soled shoes that could be worn during the winter time. In 1917 however, the Converse Company manufactured their very first basketball sneaker, the Converse All Star, as the game’s popularity was beginning to really hit a strong stride. While the shoe was met with speculation and minimal interest, a first generation baller by the name of Charles H. Taylor, also known as Chuck Taylor, made the move that forever cemented his name into the very fabric of our modern world’s culture. As a member of the Akron Firestones, Chuck Taylor was absolutely enamored with the All Star’s sturdy rubber sole and simple canvas upper. Taylor went so far as to actually join the Converse sales team in order to promote the kicks to consumers even becoming a player-coach for the corporation’s industrial league basketball squad, the Converse All Stars – no surprise with the namesake there. For the better part of 12 years, Taylor devoted his time and effort to heavily marketing the All Star kicks by running various basketball camps across the country and of course, keeping the Converse basketball team in the top ranks of its league. By 1932, Marquis and Elisha recognized what Chuck Taylor meant to their brand and to honor what he had done for their company, they bestowed upon him sneaker immortality by adding his name to the ankle patch on the side of the shoe. The “Chuck Taylor All Star” was spawned and has been conquering the world ever since, one set of feet at a time. These kicks have even endured a tour of duty having been the official shoe of the U.S. Armed Forces during World War II in which Taylor himself served as a captain in the Air Force. By the end of WWII, the NBA had been founded in 1946, concurrent with the release of the signature black and white high-top All Star sneaker. 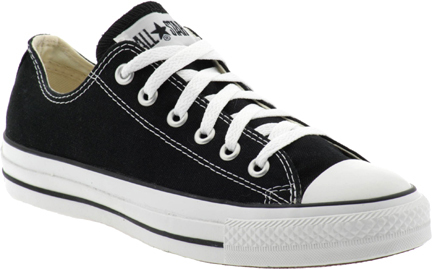 Chucks began surfacing throughout the league as each team’s general basketball shoe and in 1957, the low-top version was introduced as well. To honor Taylor’s tireless dedication and contributions to game of basketball and the sneaker industry, he was inducted into the Basketball Hall of Fame in 1968 shortly before his passing a year later. The man may be gone, but his name has clearly lived on since. Coming in a boundless array of colorways and material combinations with the low-top, double-layered black and white canvas being the most popular, Chucks are shoes that you can essentially wear with anything from a fresh tee and jeans to a blazer and slacks. Celebrities, singers, rock stars, athletes, you and me alike have all adorned our feet with a pair of these shoes at one point or another. Although its trend power is not near what it used to be with so many other ostentatious kicks being out on the market, the Chuck Taylor All Star will always stand tall, near the top, as the man behind the shoe did during his life. To get an idea of just how much of a signature classic Chucks are, the blockbuster film, I, Robot, paid tribute to them as Will Smith’s timeless go-to shoe (see below). I’m sure some of you are looking for a fresh pair as well. I recommend wearing these with a pair of Dr. Scholl’s cushion sole pads! They make them so much more comfortable.